Zecharia Sitchin was born in Russia and raised in Palestine, where he acquired a profound knowledge of modern and ancient Hebrew, other Semitic and European languages, the Old Testament, and the history and archeology of the Near East. He is one of the few scholars who is able to read and understand Sumerian. The Earth Chronicles series of books is based on the premise that mythology is not fanciful but the repository of ancient memories. The first book, The Twelfth Planet, refers to the probability that there is one more planet in our solar system. That there are twelve members, counting sun, moon and ten planets, not the nine we know of. That people from that planet came to earth almost half a million years ago and did many of the things about which we read in the Bible, in the book of Genesis. Sitchin does not seem at first glance like one of the leading forces in the ancient astronaut debate. He looks like a kindly old man with thinning gray hair and thickening glasses poised above a gently moustached mouth. He is the author of eight works on the influence of ancient astronauts on the emerging human race, starting with the 1976 best-seller The Twelfth Planet. He grew up in Palestine where he says he learned Hebrew, Semitic and European languages before attending college at the University of London, where he graduated with a degree in economic history. He worked as a journalist in Israel for many years before moving to New York City. To date, Sitchin has deciphered more then 2,000 clay cylinders from that ancient land on the Persian Gulf that existed some 6,000 years ago. Some of these fragments, which date to 4,000 B.C., are in museums around the world. One fragment in particular, presently in Germany, indicates that Earth is the seventh planet, counting in from Pluto. The time frame here is four millennia before modern astronomy confirmed the existence of Pluto as an actual planet in our solar system. So how did an ancient race of people know this fact? 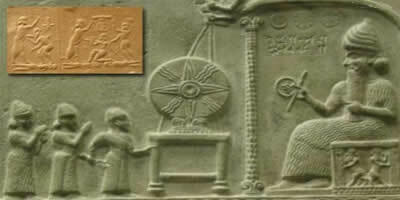 Sitchin says it is because these ancient people did not come from Earth, but from Nibiru. Profound family squabbles eventually caused the Nibiruans to abandon planet Earth, leaving human beings to fend for themselves. These early humans would never possess the ability to travel among the stars like their creators, nor would they possess the immortality of their creators. Eons later, however, we humans finally have sent an intelligently designed satellite probe beyond the confines of our solar system. Are we repeating our past? This is but one of the perplexing questions Sitchin investigates in the Earth Chronicles. Not only an eminent archaeologist, Sitchin is also a formidable analyst of ancient cultures, in fact, perhaps the best ever. His explicative comparisons of similar but disparate mythologies provide a fuller understanding of world religions. Among other things, Sitchin's investigations indicate that there may be an outpost in orbit around Mars preventing current humans from getting there (a fact verified by both U.S. and Russian space probe problems in that neighborhood). But the primary focus of this impressive research is ancient Sumer. The decipherment of that culture's clay tablets, buried for millennia, reveals roots that stretch all the way back to 450,000 B.C. The reason Sitchin was motivated to learn to read cuneiform tablets was his initial curiosity as a boy concerning the meaning of "Nefilim", an enigmatic group mentioned in the Old Testament. Translated, "Nefilim" means "those who came down." "Came down from where" is the starting point that makes the Earth Chronicles better reading than any Sherlock Holmes mystery. In order to unlock the mystery, Sitchin takes on a journey all around the world to ancient cities and former civilizations. It would be impossible to do justice to his research in such a brief review as this one; however, there are some very significant findings on the existence of this other race of people. Perhaps the most compelling is the "face on Mars," the structure in the area called Cydonia on the Red Planet. What is it? If the relationship of the face on Mars is analysed for its distance to other pyramidal structures also discovered on Mars, the geometric relationship is found to be identical to the distances of the Egyptian Sphinx and the pyramids in the surrounding areas of Egypt. Sitchin concluded the placement of these pyramids indicates that they served as landing markers for the Nibiruans after they entered the Earth's atmosphere from outer space. Sitchin also has asserted that the early pyramids were not designed by the Egyptians. NBC-TV aired a program on Nov.10, 1993 entitled "The Mystery of the Sphinx", indicating that the Sphinx is 2,000 years older than previously thought. This corroborates Sitchin's findings that someone other than the Egyptians designed the pyramids. One astounding assertion after another has made Sitchin the most controversial writer of our time because he challenges everything we thought we knew about human civilization. It's easy to dismiss Sitchin's research in the same way that other people dismiss UFO's, Eric Von Daniken and countless other researchers who claimed to have found evidence for extraterrestrial visitors to this planet. But Sitchin is well aware of this devil's advocacy, and vaporizes the arguments of skeptics with solid scholarship, including the most rigorous translations of Sumerian text, Vedic tales and excerpts from the original Greek and Hebrew versions of the Bible. This ability to translate many languages is no small achievement. Those of us who will never possess the ability to decipher 6,000-year-old clay tablets must trust that Sitchin has done his job accurately. But his sources reveal an utter integrity, including the finest, most respected citations and references imaginable. The two most recent individuals to pay attention to Sitchin were Colin Powell and Norman Schwarzkopf, the American Generals who were key figures in the recent Gulf War. The landing place of the Nibiruans was in an area once called Eridu, now called Southern Iraq. The main reason Saddam Hussein was not captured was because he was holding out in an ancient step pyramid constructed by one of those early civilizations mentioned by Sitchin, and which the Americans were loathe to bomb, because of their inestimable historical value. Once the gloss of the media is removed from consensus reality, an entirely new picture emerges as to who knows what concerning what Sitchin has uncovered. This writer may never know who knows what, but the circumstantial evidence in the Earth Chronicles concerning the Nibiruans is absolutely compelling.